Love is more than a good idea we can choose to follow or not, but love is a command. Believers, as much as nonbelievers, are free moral agents…meaning we can choose what to do. However, when we receive the Lord in our hearts, there are some commands we are expected to follow…love being one of them. Now, please do not misunderstand my use of the word command. I do not intend to give the impression that our relationship with God is some type of ritualistic, legalistic responsibility because that is religion. However, our relationship with God is possible only because of His Love for us and it is through us that He is able to show His love to the world around us. Today, probably more than ever, we are given the opportunity to show God’s Love on a daily basis. Everywhere we look, it seems that love is a much used word that is under-demonstrated. People talk about love, compassion and forgiveness but it seems that often when there is a real opportunity to show the love of God to the world…the Body of Christ misses it. In other words, far too often we fail to distinguish ourselves from those who do not confess Christ. Oh yes, this is easier said than done but it is necessary that it be done. We can do it because of the power of God within us, for nothing is impossible with God. We must absolutely lean upon His power and not our flesh…our needs, desires, weaknesses, biases, fears, etc. The difficulty with this is many of us tend to focus on our natural, physical life here, rather than our mission here. In other words, we react rather than respond. Instead of focusing on our hurts–what you did to me–let us respond with the all-powerful love of God. We are citizens and representatives of the Kingdom of God; with the responsibility to be a light in a darkened world. Not to point out the sins of the world but to allow the light of the Love and Glory of God to shine through us…judging is God’s business. This is the only way for people to truly see God. Sure, God is Sovereign and He can reveal Himself to anyone at anytime but He has chosen to reveal Himself through us. Love is more than a good idea because our Lord has directed us to Love and love is what we must do. 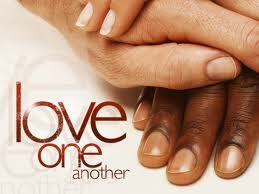 Sure we have the choice to love or not but can we really say we love God if we cannot love one another? We must face the truth of this because things are heating up and it is through our love for God that we stay connected with Him and through our love for one another that He reaches the world around us.